f.20 Poona with hill of Parvati. Boat with Indian sepoy in foreground. 'Poonah, Parbutty & Shinghur'. bl.uk > Online Gallery Home	> Online exhibitions	> Asia, Pacific and Africa Collections	> f.20 Poona with hill of Parvati. Boat with Indian sepoy in foreground. 'Poonah, Parbutty & Shinghur'. 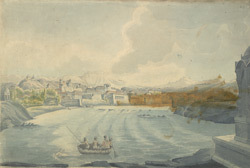 Water-colour painting of the river at Pune with the hill of Parvati in the background by John Johnson (c.1769-1846) dated to between circa 1795 and 1801. This image is from a sketch-book of 36 drawings depicting scenes chiefly in West India and Mysore. Pune is situated near to the Western Ghats in Maharashtra at the confluence of the Mutha and Mula rivers. The city prospered during the early Hindu period, largely as it occupied a strategic position on trade routes between the Deccan and the Arabian Sea. Pune was the capital of the Marathas in the 16th century until their deposition by the Brahmin Peshwa family who ruled Maharashtra for more than a century until 1818. A long series of steps and ramps leads to the top of the Hill of Parbati on the top of which is a temple built by Peshwa Balaji Rao in about 1758. On the north-west side of the perimeter wall is an Arab-style window from where Baji Rao is alleged to have witnessed the defeat of his army at Kirkee in 1817. Once the private shrine of the Peshwas, the hill is also the final resting place of Nana Saheb Peshwa.